Speak to a Scale Specialist! Detecto's "legal for trade" Price Computing Scales feature a brilliant red display that shows weight, unit price and total price simultaneously on each side of the scale to both operator and customer. 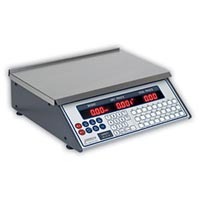 Other features include 99 programmable preset prices which are retained in memory when power to the scale is turned off, an RS-232 serial port for connection to a label printer, and customized printing features including "Packed on" or "Sell by" dates. The low profile, compact design is perfect for limited counter space in businesses like delis, meat shops, candy counters, cheese shops... where anything is sold by weight. This product was added to our catalog on Tuesday 08 August, 2006.